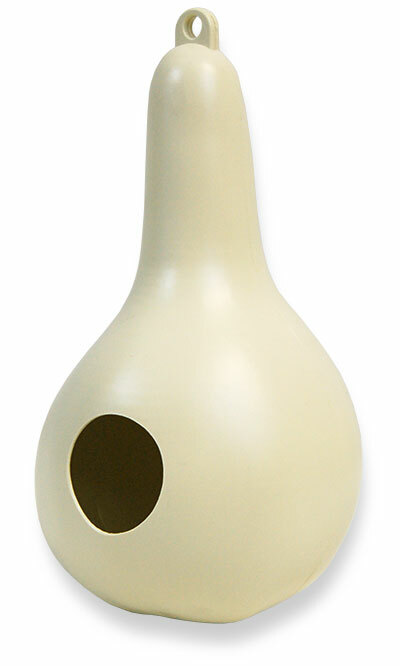 Offer purple martins their own apartment using the Heath Purple Martin Gourd. This traditional, gourd style house is crafted from modern materials, for a hardy home. The round 2.25" diameter entrance hole leads to a spacious 6.5" long, 6.5" wide interior compartment. This helps birds place nestlings a bit farther away from the entrance, protecting them from predators. A small hole at the bottom of the gourd allows water to drain, so the nest stays dry. A predrilled hole at the top of the unit allows it to be hung from a rack system (not included), or added beneath existing housing for additional room. The off white color keeps the house cool during the summer, and the plastic construction easily withstands the sun and rain. House additional martins in your yard with this Purple Martin Gourd.